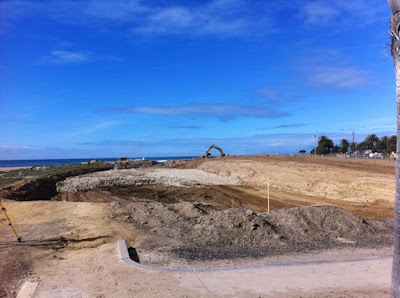 The last post described the 'Managed Retreat' process at Surfers' Point. 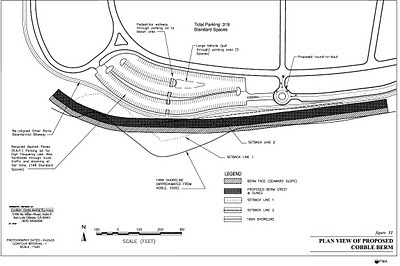 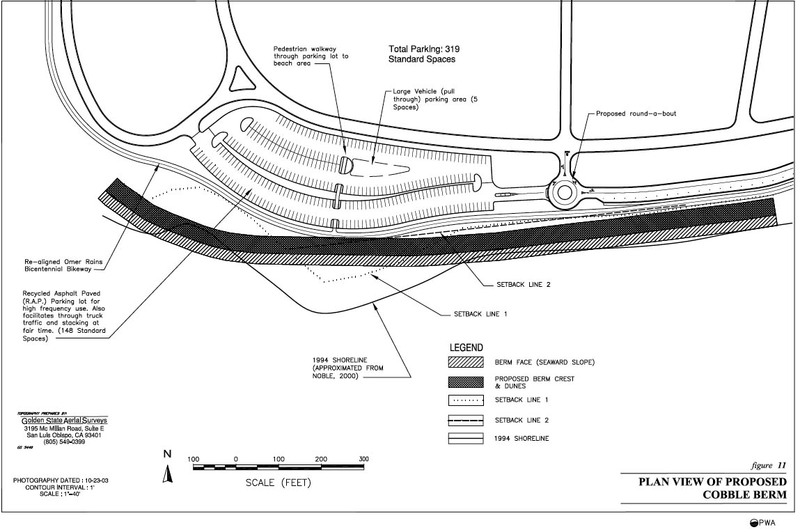 This is a description of the 'cobble berm' that is currently under construction. 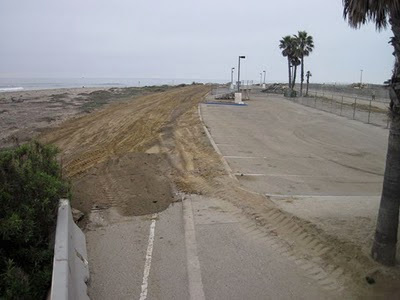 The plan is to remove approximately 3 feet of imported fill dirt that was placed beneath the parking lot in 1989, then further excavate down to the low tide level. 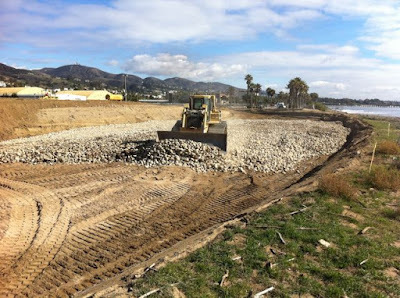 The cobble berm is constructed by filling this area with an estimated 30,000 tons of river cobble between 6" and 18" in diameter. This 8 ft thick cobble berm will then be buried beneath constructed sand dunes. 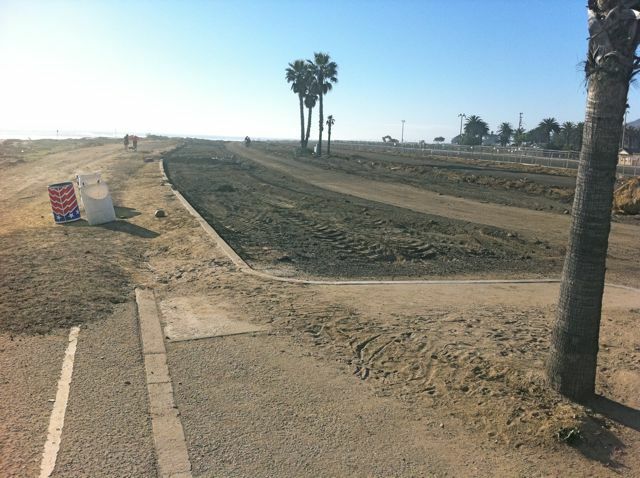 The idea is that when the beach erodes in future swells, this sand and cobble will provide natural shore protection for the bike path and fairgrounds parking lot. The cobble is being transported by truck from the Corps of Engineers project on Santa Paula Creek. 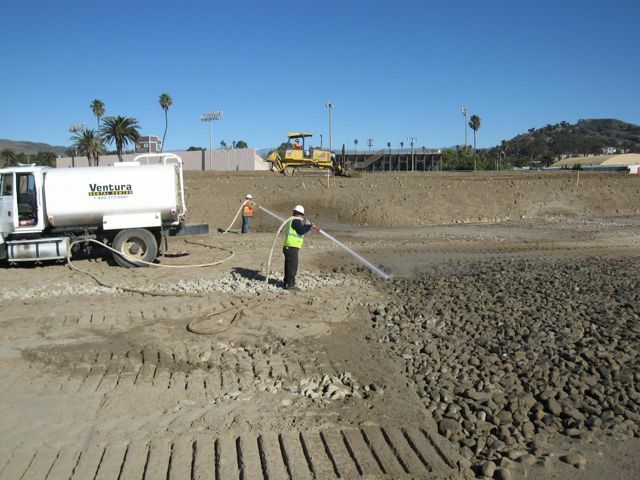 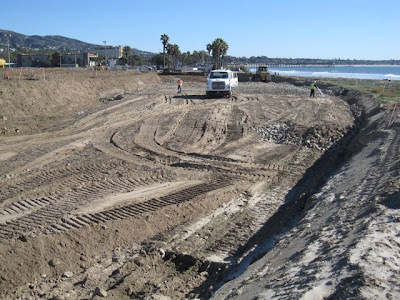 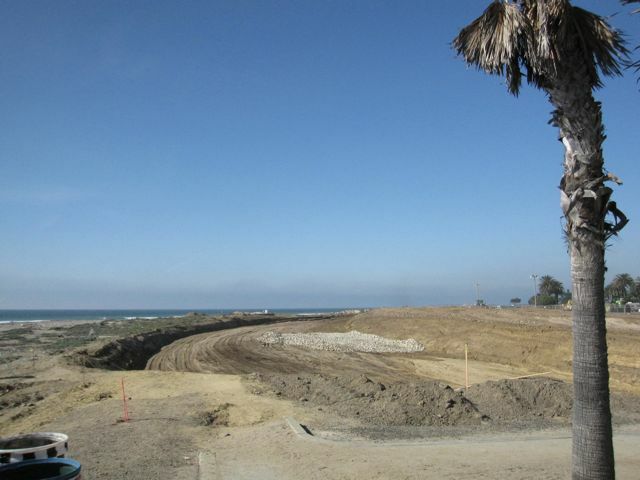 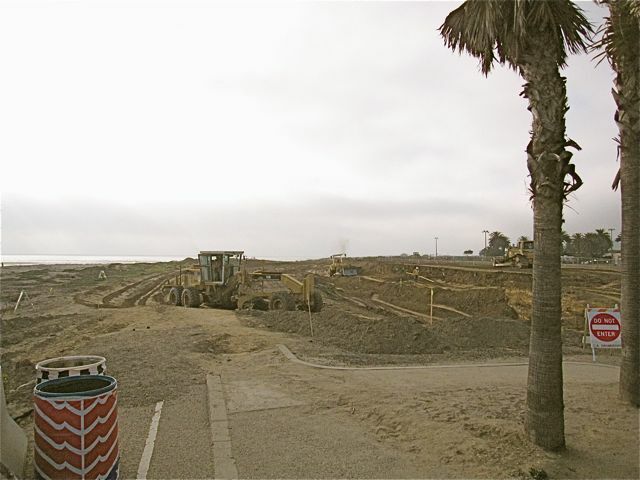 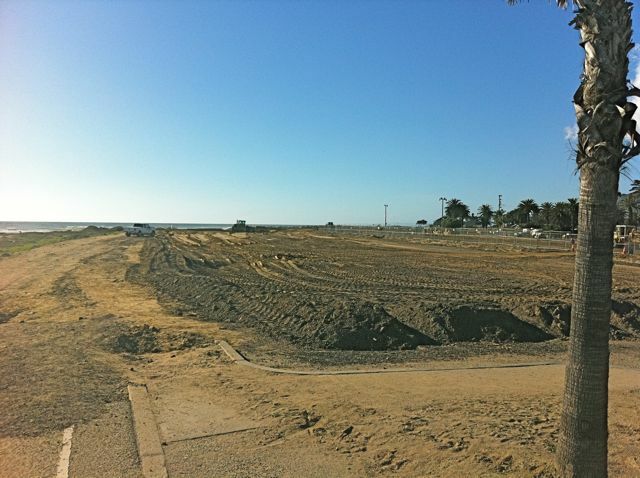 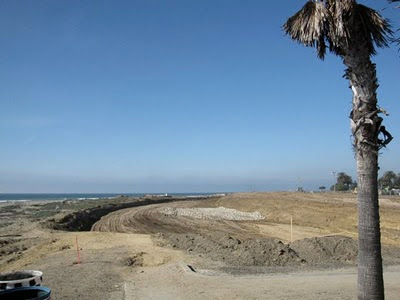 ($4 million to clean out lower Santa Paula Creek to increase safe capacity prior to major storms) The Surfers' Point project calls for 30,000 cubic yards (about 3,000 truck loads) of cobble, and approximately 15,000 cubic yard of sand. Once approximately 3 feet of cobble has been delivered and graded flat, sand is then placed on top and flushed with water hoses so it fills the spaces between the cobble. 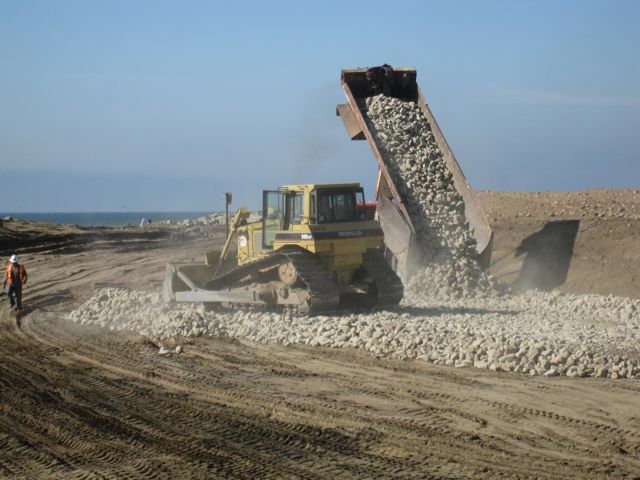 Additional layers of cobble and sand will gradually build up the berm to meet engineering specifications. 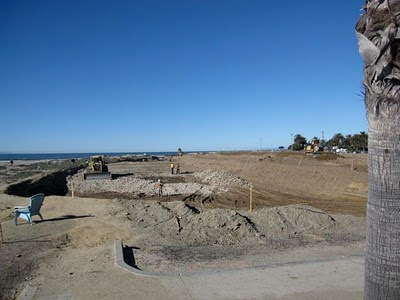 The scale of the berm is evident in this photo of the retreat zone - here the first 3 foot layer of cobble has been placed, and sand is being worked into the spaces.